If you want to increase reader engagement, knowing how much engagement your content is generating is only half the story. You also need to understand who your audience is to make more informed decisions about your strategy and identify ways to better serve them. That’s where the Community Members table in the new Audience Analytics comes in. It provides a detailed look at the readers who make up the heartbeat of your site’s community including when they first engaged, their total activity, and engagement status. In the final part of this series, we’ll take a closer look at the Community Members table. We'll walk you through 3 strategies for connecting the insights you find to actions you can take for increasing engagement. If you're just joining us, be sure to visit the previous posts in the series below to learn more. To identify your first-time commenters, sort the Community Members table by “First Engagement” and look for anyone who has posted a comment. Clicking their Display Name returns their most recent comments in the Moderation Panel, letting you see which articles they commented on and what they had to say. When readers post their first comment, take the opportunity to create a positive and lasting experience for them. Reply to their comment to welcome them to the community, thank them, or ask a question. These types of early interactions greatly shape whether they remain engaged longer-term. On the other hand, if they are left feeling frustrated or have a bad experience, they might decide to leave and not return. Over at Nom Nom Paleo and SpoilerTV, they do a fantastic job of encouraging their newest members and making them feel appreciated when they post their first comment. Generally, we find that the faster you respond to a new comment, the more likely the user is to reply back. So remember to keep the conversation going! As you’re browsing your list of Community Members, get to know your readers by visiting their profile, reading their latest comments, and checking out the communities they have frequented. To find your most active commenters, sort the table by “Engagements” to see the users who have contributed the most comments and votes. This also lets you see the distribution of users who continue to return, recently came back, or haven’t engaged in a while. Take it one step further by creating a reader survey and inviting your audience to share their feedback. A great example of this comes from the local news site ARLNow.com who sends out an annual reader survey to learn insights that will shape their future efforts and strategy. Promoting readers for their contributions is a powerful tactic to keeping them engaged and coming back. Start by featuring the best comments in every discussion. This pins it to the top of the thread and notifies the commenter that their comment were featured. Upvoting comments lets readers know you appreciate their contributions and are listening to what they have to say. Adding top contributors as Trusted Users ensures that their posts automatically get posted without being held up in moderation. Over at Destructoid, a gaming news site, their popular “Comments of the Week” series celebrates the best comments from readers. 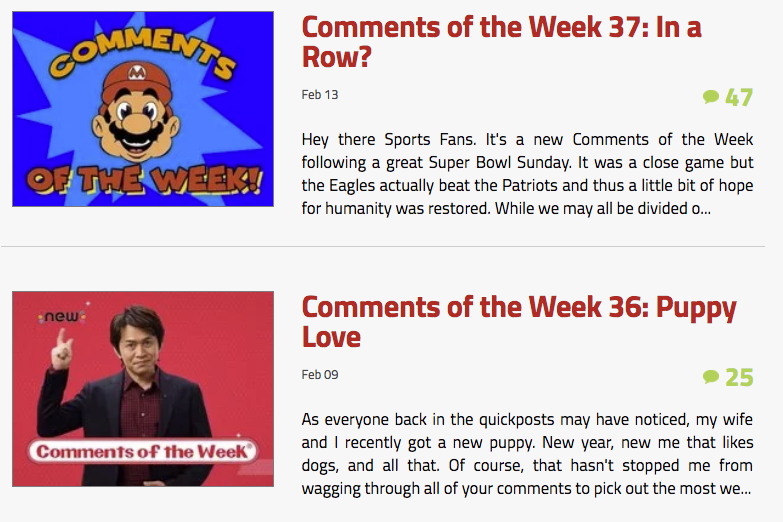 Besides the thrill of seeing one of your comments being featured, it offers the community a chance to reflect on their favorite moments together and gives them something to look forward to every week. We’d love to hear how you’re leveraging the Community Members table to boost engagement so share your feedback or questions in the discussion below!